3" X 3.5" 3" X 3" 3" X 3" 3" X 3" 3" X 3" 3" X 3"
Clear vinyl window stickers are die cut and screen printed using UV (Ultraviolet) inks to give your company many years of use in all types of climates without fading. These durable clear vinyl window stickers hold up well in the extreme sun of Arizona to the freezing conditions of Alaska. 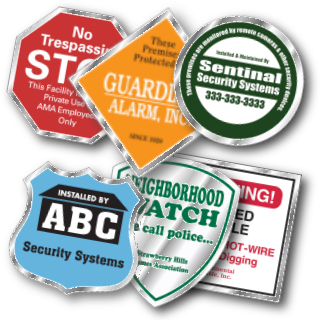 Our monitoring and surveillance decals are available in six popular shapes and are commonly used for Block Watch organizations, no-trespassing signs and security alarm companies. 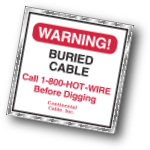 These window stickers are very popular with all types commercial building and retail stores for general information or required warnings. Matching outdoor signs and stakes are on sale for the month of April starting at $1.19 each. Click on the BBB link below to see why we are the top choice for alarm and security company window stickers. 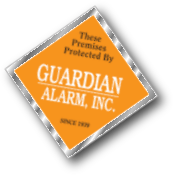 For almost 2 decades, deSIGNery Signs has supplied thousands of security companies and alarm companies with high quality clear window decals. We have maintained an A+ rating with the BBB Better Business Bureau since joining in May of 2004. Each customer and every order is important to us! Because we do not spend money on advertising, we are able to keep our prices competitive and offer free shipping on most orders. We scrutinize every order looking for cost cutting ideas and better value for your advertising dollar. We rely on repeat orders and word of mouth for advertising.